just as Eddie the Mailman showed up at the door. that Norwegian Roy was dead. all had a drink on me, Tony T.
Initially, he gave his name and, honestly, he tried to explain himself. Annoyingly, he began each attempt with an adverb. Inaccurately, he thought this would be edifying. Sadly, she considered his undertakings pointless. Ironically, he agreed with her, while theatrically he had felt upstaged for years. Biblically, the book was closed. each day and glisteningly the stars appeared at night. paradoxically he watched from the azure sofa of space and sleep. Although the rain petals soften our view in elaborated sympathy. . .
Or have crushed the arboreal light above the blameless road . . . The sky may essentialize but the nurse drives on. Wintry murmurs leave us blissfully in a ditch above the stars. Finance data raises doubts of city board. that last one makes no sense. Has romance become inconvenient for you? Have you become too busy to revise your idiosyncratic state? or do you maintain editorial control? For example, if you say, But think why such tiny lakes rob men so. in unelaborated sympathy, or words to that effect? Or does she simply retort: Go, in bitter mist? In any case, I inscribe her response on the hollow shell of my existence. merely extend the stammering of adolescents. the implications of my most recent transformation. and turn on the TV: Here Come the Lombards! find happiness in the Po Valley?" but here is the woman of my dreams. Tony Towle was born in New York in 1939 and has lived there most of his life, at present in Tribeca. 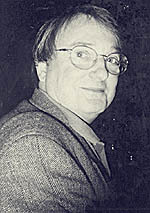 He became associated with the New York School of Poetry in the early 1960's, and won the Frank O'Hara Award in 1970, in conjunction with which North was published. Other volumes include Autobiography, Works on Paper, and Some Musical Episodes, the latter from Hanging Loose Press in 1992, which will also be publishing The History of the Invitation: New & Selected Poems 1963-2000 later this year. "Fugitive Visions" appeared previously in Shiny, and "The Art of War" and "Introduction & Exposition" in The World.